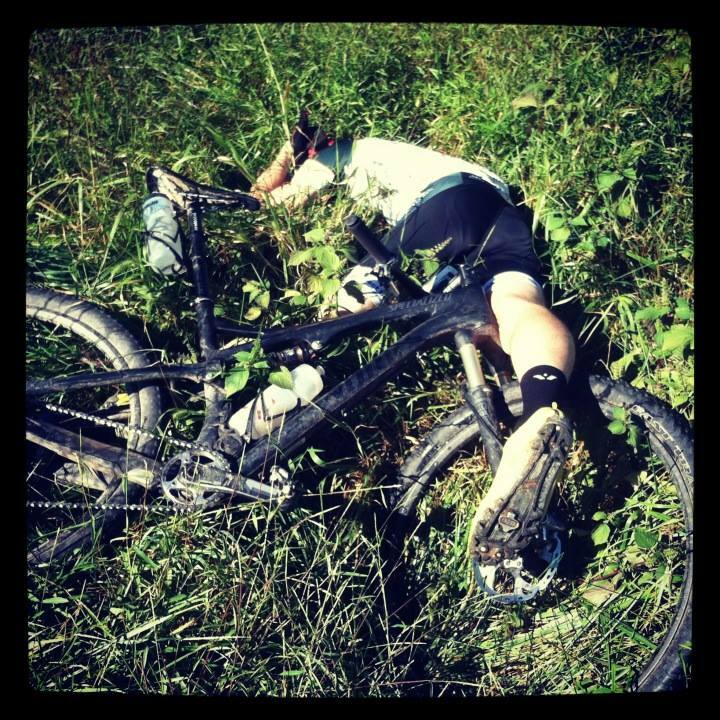 Crashing is part of cycling and that surprises a lot of people. I separated my shoulder and broke a finger a few weeks back and you'd think I did it playing badminton; people were amazed! Crashing seems to be most prevalent in racing as thats when riders take the most risks. When you have trained hard for months and years to achieve a goal, taking a turn as fast as you can with a small chance of crashing, seems worth it. So, riders push themselves and their bikes to the absolute limit, hoping to not crash but recognizing they might! Most of my crashes are at low speed and on my mountain bike. During Dragon's Tale mountain bike race, I was chasing down a rider in 11th place. I finally caught sight of him up the trail, and at that exact moment my concentration broke, I clipped my handlebar on a tree and went down. Another time I was training with a friend. We were riding through a field with tall grass when my front wheel disappeared into a hole! I slowly felt my rear wheel lift off the ground and over the bars I went. The worst crash I've had was back in 2009. I was in a group riding down a hill with a tight left hand turn midway down. My rear tire flatted when I was going about 35mph and I began losing control of the bike. I opted to go off the road instead of laying the bike down in the left hand turn. Unfortunately, there was a nearly vertical embankment directly off the road. My right shoulder slammed into it, damaging the muscles in my arm and breaking my scapula and part of my humerus. That took months to heal! Crashes really do happen all the time, with some being much worse than others. While cycling has low impact on your body respective to football or running, there are definitely moments when it becomes a painful and high impact sport.